WHO is Tubby the Robot? Our clients love Tubby. There’s an innocence and charm about him that connects with every kind of audience. “For the first time since Floriade’s existence, Events ACT, the organisation behind the event, contracted the Happy Android Company to deliver Tubby the Robot at Floriade 2013 – Beautiful Innovation. Tubby the Robot was engaged to deliver roving performances at the event for an entire week and these were successfully delivered each and every day. The team behind Tubby the Robot were extremely professional and flexible when it came to determining the best act for the event. The Happy Android Company came up with a new concept for Tubby’s appearance at Floriade, which went above and beyond the required proposal. The level of enthusiasm shown by the team even at this point was recognised and made for an enjoyable planning phase. During the event Tubby the Robot was a massive hit for all ages. Tubby entertained crowds that pleasantly stumbled upon Tubby in the park and were intrigued by the performance. The performance was a wonderful photo opportunity and provided an outstanding level of interaction for those watching. Without a doubt, Tubby was one of the most popular performers at our events – for children, teachers and parents alike. Tubby is visually appealing and his electronic-themed act is exciting and imaginative. Tubby was especially suited to the numeracy aspect of our Literacy Trails thanks to his focus on numbers and counting (as robots do!) He also offered a great link to the future direction of education, thanks to his obvious relationship to robotics and information technology. “Thank you for your involvement in the Queensland Art Gallery’s ‘The Nature Machine’ Holiday Program… Your performance as ‘Tubby the Robot’ was invaluable to the success of the festival. Your intuitive ability to improvise and interact with a continuous crowd of inquiring children and their families is a credit to your artistic practice. “Just a note to sincerely thank you for your contribution to the Queensland Government Pavilion at this year’s Ekka. “Tubby the Robot came along to our client movie days in both Melbourne and Sydney. Ericsson’s client movie days are an important part of our annual events calendar as they allow us to interact and entertain our clients and their families in a fun and relaxed environment. “Belinda and I wanted to say thank you very much on behalf of the NMA for your 3 wonderful performances on Monday. Tubby is an absolute delight and we were astounded at how popular he was. The Canberra times featured you yesterday (attached a copy). As I mentioned, we would be very interested in working with you again as opportunity arises. “My family and friends saw you today at Docklands; you were excellent!! It was refreshing to see such a different act. Your costume was excellent and your interaction was great. “The children’s events I organise are very popular and they have developed incredible audience loyalty in the seven years they have been taking place. During this time I have worked with a considerable number of artists especially those catering for younger children. I emphasise to the artists I work with that they require considerable flexibility working on my Children’s Day events as well as a lot of energy and dedication to really engage with the children and their families. Tubby the Robot joined these events in 2011 and it has been an absolute pleasure having Tubby on board. Throughout all stages of the program from pre to post event, the communication from Tubby and his team has been professional, reliable, open and clear – which is always reassuring and appreciated. Tubby took on board my event requirements and had the flexibility and professionalism to deliver them beautifully, contributing to the wonderful success of the event. Not only was Tubby addressing my event requirements but he was also very aware of the needs and requirements of the other artists in the event, which was great to see and very much appreciated as an event organiser. 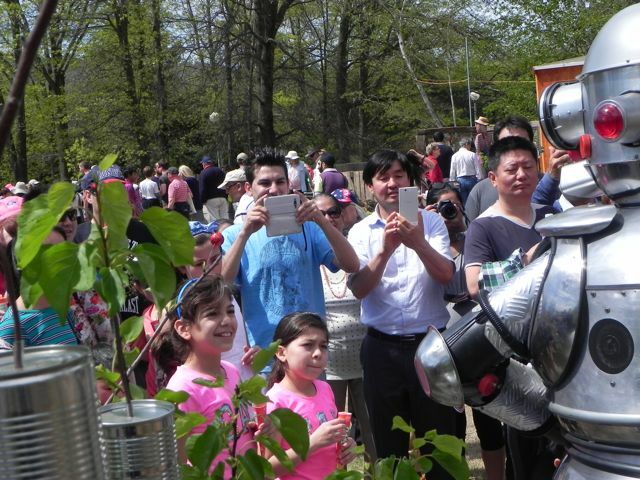 I am thrilled that Tubby the Robot was able to join my Children’s Day events as he contributed such a wonderful sense of fun and curiosity to my event, engaging not only the young ones but the teens, parents and grandparents as well. I hope to develop my working relationship with Tubby and his team in the future to create innovative and engaging ideas for the communities to be part of and the enthusiasm and passion that Tubby and his team have for this is really exciting and refreshing. Tubby the Robot is one of Australia’s most lovable interactive character acts. He’s charming, articulate and delightfully absurd at once - a great choice for festivals, launches, community events and corporate functions.